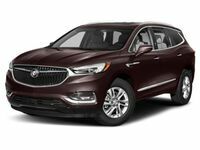 At the top of Buick’s luxury crossover lineup lives the 2019 Buick Enclave. With seating for up to seven total passengers and a healthy cargo capacity of 97.6 cubic feet, the Enclave is the largest crossover from Buick and a perfect choice for larger families or for anyone looking for a model packed with amenities. Even base trims on the 2019 Enclave don’t disappoint and the full lineup provides something for everyone whether they are looking for comfort, connectivity, or a full list of active safety. Drivers in the Cape Girardeau, MO area can find the 2019 Buick Enclave available for test drive and purchase at their nearest Chris Auffenberg Buick retailer. The 2019 Buick Enclave is stacked with a variety of safety features that can help to make drivers feel more comfortable behind the wheel. Enclave shoppers looking at the new 2019 model will find a full suite of active safety available among the lineup including a Surround Vision 360-degree camera, Lane Change Alert, Side Blind Zone Alert, Rear Cross Traffic Alert, Lane Keep Assist, Lane Departure Warning, Front and Rear Parking Assist, Forward Collision Alert, Low Speed Automatic Emergency Braking, IntelliBeam Headlights, a Following Distance Indicator, and Full-Speed Cruise Control. Additionally, the 2019 Buick Enclave offers a few extra safety features that shoppers may not be as familiar with including rear seat reminder and an available rearview camera mirror. Rear seat reminder helps drivers to remember any passengers or cargo in rear seats by sending an alert to drivers at the end of each trip where a rear door was opened prior to starting the vehicle. The available rearview camera mirror system allows drivers to toggle between a traditional rearview mirror or a camera feed showing live footage from behind the vehicle, which can be helpful if tall passengers or larger cargo items in the cabin are blocking the view. For more information on the safety features available by trim level or to set up a test drive, contact a Chris Auffenberg team member at one of our Buick retailers including Auffenberg Chevrolet Buick GMC in Farmington, MO and Auffenberg Carbondale Buick Cadillac GMC in Carbondale, IL. Interested in a 2019 Buick Enclave?